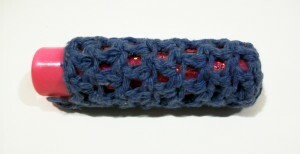 There are lots of lip balm holder patterns, but not many sized for large tubes. For those who happen to like moisturizing with a larger-sized lip balm and want a convenient way to carry it, this pattern makes a basic holder that stretches to fit. If adding to a keychain, you can always loop the end through the key ring before you finish off. This entry was posted on Friday, October 12th, 2012 at 8:43 AM by Candace	and is filed under Free Crochet Patterns. You can follow any responses to this entry through the RSS 2.0 feed. You can skip to the end and leave a response. Pinging is currently not allowed. THANKS, I appreciate this easy pattern to crochet a lip balm case. I plan to make mine in bright orange acrylic yarn as I have leftovers from a doll blanket. I crocheted a bright doll blanket in 4 colors for Josephina, American Girl 18-inch doll, starting in the center rectangle with red, gold, orange and taupe. My 8-yr old grandniece loved it!